Alien Lunch, originally uploaded by Misty DawnS. On Flickr, we refer to Wednesdays as "Bokeh Wednesday". Considering how much I enjoy macro photography, bokeh holds a special place in my heart. hehe For those of you who don't know, bokeh is the blurred, out-of-focus (is that redundant) background in a photograph, while the main focus of the photograph is sharp and detailed. In this photograph, the head and forelegs of the Praying Mantis, along with its Bumblebee snack, is in focus, while everything else, including the insect's body is blurred... aka bokeh. I don't mind praying mantises! They are all over the place where I great up. I used to love posing them. They are hilarious critters. I think it's a fascinating capture. I love preying mantises. love reading ur articles. can we exchanges links dear pls?if that is ok with you.thanks!! Great shot! I love it Misty! What a wonderful find! Hey Mist...I'm working on a bug post for tomorrow that might interest you. ;-) I never used to be a fan of bug photography, but my opinion on this changes more and more as time goes on. They can really be quite beautiful and fascinating. I love your image here and I'm a pretty big bokeh fan myself. Beautiful nature work. I love it. Beautiful capture! 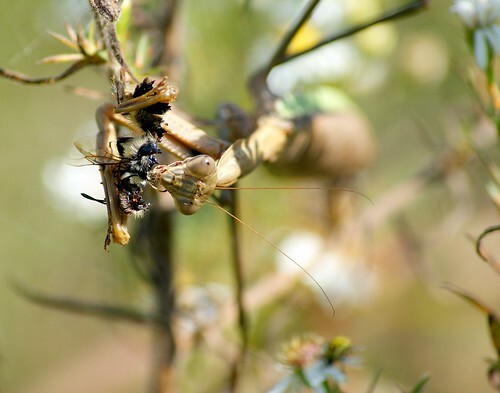 I have watched many mantises, but never seen one eating. How cool!